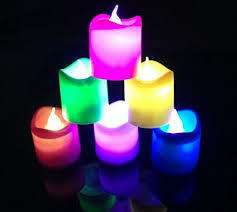 Are you wondering what candle color to use for a particular spell, ritual, or just to select for beautifying you homw? Every color has certain magical significance. This list should help you understand the unique vibrations of colors, and their attribute, symbolism, and potential influence in meditation or spells. White candles represent the purity of the Spirit. White symbolizes spirituality, sincerity, virginity, truth, purity, spiritual strength, aura, healing, peace, cleansing, protection, energy, the Goddess, higher self, consecration, meditation, divination, exorcism, the full moon, and clairvoyance. Witches use white candles when summoning the spirits or communicating with the spirits. Silver candles represent the Mother Goddess, moon, purity, values, female energy, the unconscious mind, helps develop psychic abilities, astral energies, clairvoyance, telepathy, and intuition. Silver candles represent dreams, helps remove negativity, stability and communication. Silver candles are said to help you develop stronger psychic ability. Gold candles represent the Father God, sun, cosmic influences, male energy, conscious mind, intelligence, happiness, activity, healing rejuvenation, wealth, financial wisdom, and winning. Gold candles are often used in spells of attraction, as gold can represent either the masculine man, or the good luck, that you are trying to attract. Red symbolizes fire, strength, health, vigour, courage, energy, vibrancy, driving forces, survival, will power, career goals, speedy action, passion, sexual love, physical desire, danger, enemies, and war. Red is often used for spells of attraction as well especially for carnal desires such as becoming a man magnet or inspiring lust in your love life. Back reaches into the deepest level of the unconscious. Use this color for very deep meditation, protection, and to quit dangerous and unhealthy habits such as smoking. Black means negation. Black candles are often used for banishing spells. Use black to fight negativity, repel evil, binding, loss, discord, and confusion. Black will fight evil spirits well. Pink candles should be used for emotional and spiritual healing, femininity, banishing hatred, compassion, honor, service, compassion, caring, nurturing, peace, morality, romance, emotional love, family, friendship, and affections. Pink is a major symbolic color for giving and charity, and is also very feminine. Orange candles represent encouragement, adaptability, stimulation, vitality, energy, stamina, mental agility, kindness,fun, luck, fortune, prosperity, abundance, success, business, career, ambition, justice, legal matters, and selling. Use orange candles for when you are in the mood to take action! Yellow is beautiful and represents the air, sun, activity, creativity, imagination, visualisation, knowledge, unity, learning, concentration, confidence, insight, healing, memory, charm, eloquence, comfort, joy, and travel. Yellow is a very effective color of persuasion and can help you manage mood swings, and mental blocks. Yellow is a great color that will help you sell home-made products. Green represents the earth, fertility, growth, rejuvenation, herbal healing, physical healing, employment, ambition, personal goals, prosperity, success, finances, luck, charity, and harmony. Use green environmental causes, and to counteract greed and jealousy. Blue is the color of tranquility. It inspires peace, calm, patience, understanding, reassurance, guidance, devotion, inner light, inspiration, wisdom, creativity, sincerity, honour, loyalty, truth, health, cleansing, emotions, harmony, meditation, astral projection, and prophetic dreams. Blue is mostly used for doing psychic work and will also provide you with excellent protection for sleeping. Sweet dreams! Magenta can help inspire immediate action and is the color candle to use when you need super strong power or spiritual healing. Grey is Zen, and will inspire Balance, neutrality, erasing, cancelling, neutralising, and elimination of confusion. It is a soothing color of clarity and clean lines. Copper inspires passion, professional growth, fertility in business, and career moves. It is almost always used for spells involving entrepreneurial pursuits. Purple is a power amplifier and is strong in, power, success, idealism, independence, ambition, wisdom, ideals, piety, sanctity, and sentimentality. This color is known for strong psychic ability. With a vibrant hue, such candles emit protective energy, meditation, third eye, male energy, and spiritual protection. Purple is often use by witches when they are seeking psychic manifestations. Use purple candles for healing, to relieve tension, and to combat sadness. Brown candles represent the Earth Influence. Use brown candles for meditation aimed at grounding, concentration, telepathy, protection, and deep meditation. Brown helps to eliminate indecisiveness and is a color of grounding and stability. This color brings you more in tune with nature, and can protect spirits, pets, and all forest animals. Brown is great for spells to find lost objects or people, reduce hesitation, provide protection, and to inspire friendship. Hopefully this guide will give you a bit of an idea of what candles colors might work best for your personal meditation, to bring peaceful beauty to your environment, to provide protection, bring wonderful things into your life, and for many Wiccan spells. Posted on January 24, 2015 by admin. This entry was posted in Wiccan Rituals. Bookmark the permalink. Wicca witchcraft, goddesses, natural beauty secrets, love spells to attract men, fountain of youth myths, essential oils, aroma therapy, organic beauty recipes, earth's natural elements and minerals to enhance beauty, and letting your inner goddess shine through!